Here is another relevant token with a maker's mark. This one has "HZ" incuse on a small rectangle. 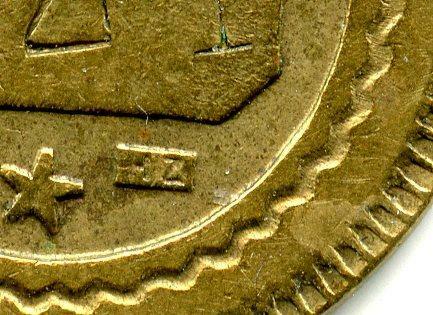 I consider the stamped "400" to be inverted being as the 5-pointed stars (of this size or larger) most often appear "pointing" upwards as illustrated above. Also I have seen an image of a piece of the same type where the stamped number is "411" and it is what I would consider to be the right way around. 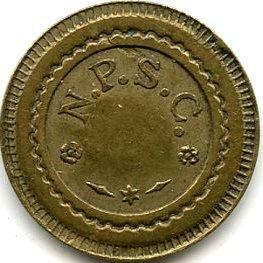 The British Machine Token books mention a maker by the name of "Zimberlin" and that "N.P.S.C." was "New Polyphon Supply Co., London". A polyphon was a type of musical box. Another NPSC, with the A Consommer reverse. 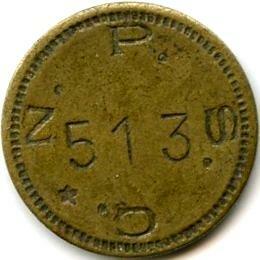 Confirmation that the HZ mark is that of Zimberlin with this French machine token bearing both his mint-mark and his signature Zimberlin.